Barbara Ann Babcock died peacefully at the Martha’s Vineyard Hospital on Sept. 22, 2015, of complications from lung cancer. Barbara was born on March 1, 1932, at Methodist Hospital in Indianapolis, Ind., to Charles Dwight Babcock and Helen Flanagan Babcock. She graduated from Shortridge High School in 1950, attended Denison University, and received a B.S. in occupational therapy from Ohio State University in 1955. After graduation, Barbara worked at a hospital in England, and then, with a friend, bought a bicycle in Germany and cycled throughout Europe. This trip initiated Barbara’s great passion for travel and new experiences. Barbara later worked in her field as an occupational therapist in Chicago, Milwaukee, and Indianapolis. It was in Indianapolis that she met and married Dr. Edwin F. Koch Jr., and moved with him to Louisville, Ky. There she studied psychology at the University of Louisville. In order to be near both of their families, the couple settled in Muncie, Ind. In Muncie, when her children were young, Barbara kept busy taking classes at Ball State University and volunteering in the community. She volunteered with United Way, Head Start, and Planned Parenthood, and was one of the founders of the Alpha Center, a daycare center for senior citizens. When her daughters were older, she returned to full-time work as the director of the Muncie Children’s Museum, received a master’s degree from Ball State University, and eventually became the executive director of the Easter Seals Society of Delaware County. Her time at Easter Seals was a great joy for Barbara. The society operated out of Isanogel Center on the outskirts of Muncie. The offices were in a rural setting, which in the summer housed a camp for handicapped children. Barbara was able to bring her expertise as an occupational therapist, her management experience, and her great people skills to Camp Isanogel and the Easter Seals Society. She had a special gift in bringing together diverse members of the community to the board of directors, hiring talented camping staff, and running the day-to-day operations of a camp and nonprofit organization. Upon retirement in 1990, Barbara moved back to her home town of Indianapolis. Shortly thereafter, in order to be near her elderly mother, Barbara temporarily moved to Sarasota, Fla. In Sarasota, Barbara embarked on a new career. She enrolled in the Sarasota School of Massage Therapy, and received her certification in therapeutic massage. While visiting her daughter Helen one Christmas in the mid-1990s, Barbara fell in love with Martha’s Vineyard. Her other daughter had just moved to the East Coast, and Barbara decided the Vineyard would be a great place to live to be close to her children. She bought property and moved full-time to the Vineyard in 1997. The Vineyard was the perfect fit for her. She rented out rooms, gardened, and made many great friends. Barbara travelled frequently, often accompanied by her daughters. Her ultimate travel experience was with little Barbara, and millions of other people, taking part in the Kumbha Mela in India in 2001. On the Vineyard, Barbara was introduced to the world of papermaking by taking a class with Sandy Bernat at Seastone Papers. With the “paper people,” Barbara traveled and studied the history of papermaking in Thailand, China, and Burma. Barbara also generously cared for her ex-husband when he was diagnosed with Parkinson’s disease. She helped him move from Muncie, Ind., to Falmouth, and oversaw his care until his death in 2011. 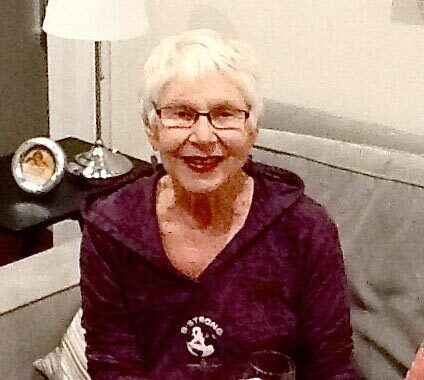 Until recently, Barbara was exercising weekly at Be Strong in Oak Bluffs, reading voraciously, and making sure that everyone in her life was OK. Barbara’s infectious personality, warmth, intellectual curiosity, and lust for life will be missed by many. Her family would like to thank the amazing staff at the Martha’s Vineyard Hospital, Horizons Geriatric Care Management, and Sostek Home Health Care. Her caregivers, especially Pat S., Diana A., Diana P., and Patricia A., were all compassionate and gave excellent care, companionship, and friendship. In lieu of flowers, her family would like memorials to be made to Planned Parenthood. Barbara Ann Babcock is survived by her daughter Helen Koch of Vineyard Haven, her daughter Barbara Koch of San Francisco, Calif., her sister Sally Jones of Largo, Fla., her sister-in-law Janet Babcock of Long Beach, Calif., and her brother David Babcock of Oaxaca, Mexico. Her parents, her former husband Edwin F. Koch Jr., and her brother Charles Babcock predeceased her.